Currently we have developed 3 Dictionaries. These dictionaries are English - Hindi, English - French and English - Spanish. These dictionaries are free to download. Before use these dictionaries if you want you can read privacy policies of these dictionaries. 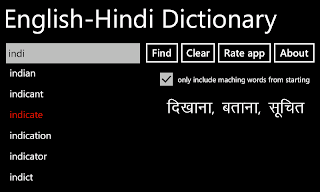 This dictionary will allow you to translate English word(s) to Hindi. This is free application. 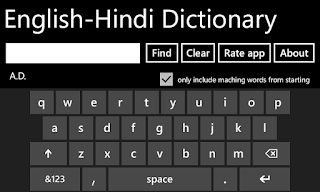 Find: after type word in textbox it will give you list of all matching words, if you will left textbox blank then after press this button it will show list of all available word in this dictionary. Clear: it will clear value of textbox. Rate app: if you want to give rating of this application then press this button and choose stars form 1 to 5, if you hate this application then give 1 star, if you like this application then you can give 5 star and you can also write you review there, your feedback is important for me. About: It will give information about this application. 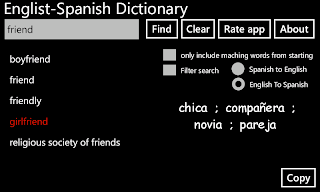 Only show matching words from starting: If you will unmark this checkbox then if you search any word then it will also show you that words which are also matching from middle, for example if you Search friend then it will also show you girlfriend, because girlfriend word contain friend. If you don&apos;t want enable this feature then mark this checkbox. This application will allow you to convert English words to Spanish and Spanish words into English. 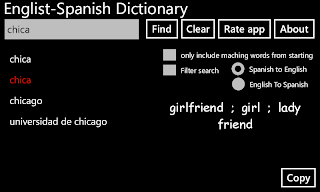 First select language in which you want to search, If you want to search meaning of English word then select English to Spanish if you want to search meaning of Spanish word then select Spanish to English. Filter search: If you think that it give some unwanted words in list then you can check this checkbox. Copy: If you want to copy meaning of any word then after find that word just press this button, it will copy that in clipboard, then you can paste it anywhere. 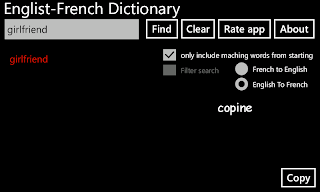 This application will allow you to convert English words to French and French words into English. 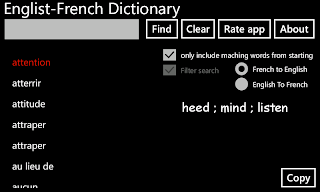 First select language in which you want to search, If you want to search meaning of English word then select English to French if you want to search meaning of Spanish word then select French to English.